Here are my top 10 tips for photographing runners, as origionally featured in Mens Running Uk. When photographing an endurance running race such as BAM Racing’s Great Glen Ultra you have the opportunity to capture the emotions and stories of the runners, whilst showing off the beautiful and often rugged scenery. The key to success is to plan your spots meticulously. Scour the maps looking for viewpoints, high points, areas of rough or rugged terrain and note these down. If you can, get out and recce the course beforehand. Be prepared to cover some distances and push yourself hard during the race to get to as many different locations as you can. The shots I work hardest for often turn out the best. Below is a run through of ten images from the Great Glen Ultra this July. 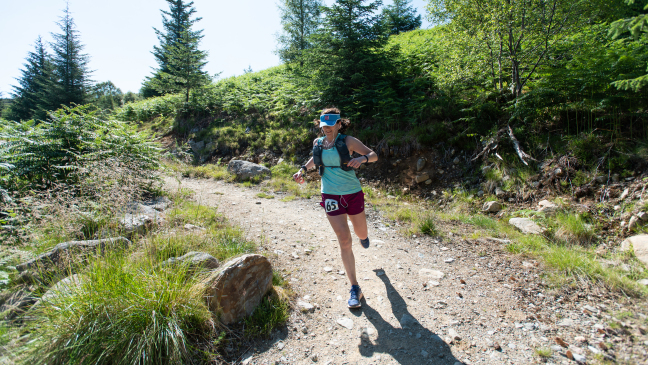 Running any race is always a nerve wracking thing, especially if your starting in the middle of the night like you are on the Great Glen Ultra. As a runner you’re thinking about the route, making sure you have everything you might need and trying to rest and conserve energy for what’s to come. Capturing this pre race moment is really important for a fully rounded coverage of the event. The initial rush from the start line always has a great buzz and it’s an image that you only have one shot at capturing, so you need to make sure its right. I had worked out my composition and settings earlier in the evening so that I knew I could nail it quickly. Long exposures with headtorches work nicely to show movement whilst also showing off the spectacular start point of the Great Glen Way and the race. Shooting runners in the dark is hard. Head torches give a lot of contrast and the movement means that longer shutter speeds create blur. A good option is to use an external flash. They allow you to light a scene and freeze movement. Manually focusing the camera is a good tip too, and using a tripod takes away any risk of blur in the background from camera shake. Just before the sun comes up, the light is really soft and in the summer you often get mist inversions which help create an atmospheric image. Think about the rule of thirds with these shots and get your runner off to one side. As the sun starts to rise higher don’t be afraid to shoot straight into it. Shooting in forests or darker places works nicely to contrast against the sun. And again placing the runner off centre but prominent means that your eyes will focus there first. Sometimes its nice to have to search around before you can find the runner in an image. Placing the runner ‘deeper’ into the shot adds a sense of scale to the landscape. Using the natural line of a trail to guide the viewer’s eye around the shot works nicely. As the sun rises higher still, rather than fighting the light, use it to your advantage. Take off the lens hood to get flares and shoot straight into the sun. Try to make sure the subject is off to one side to draw the viewer’s focus. Having pre planned where the ‘beauty spots’ are you can be sure you aren’t missing any of the best locations. Asking the Race Director or Course Planner for their opinions on the best places to head is always a good idea. But, generally speaking, if you want to capture those panoramic views, the higher altitude the better. Get down low in these places, and try and get some foreground interest to help better set the scene. Make sure you don’t get too caught up in the arty shots. It’s always good to have some shots of runners just having a good time. After all thats what it’s all about! Most importantly go out and enjoy yourself. With a stream of happy runners passing you at each of your chosen locations you have plenty of chance to nail each shot. If you’re smiling and encouraging and having a good time behind the camera, it will show in front of it. The next GGU race will be held on July 6th 2019. Regular updates here at the Facebook page. Thanks to Matt Maynard for linking me up with Mens Running for this one.